It's video card time. But should I wait? I want a faster video card for my gaming PC/Hackintosh and I have budgeted about $200 for this component. The Windows side can run anything, but on the Mac side I need something a little older since I’m running El Capitan (EC doesn’t work with any of the 10x0-series cards - only 10.12 and above do) and don’t have any plans to upgrade that OS in the immediate future. I’m currently running a GTX 670 which is good, but not stellar. I mostly run simulators, so frame rate is critical. 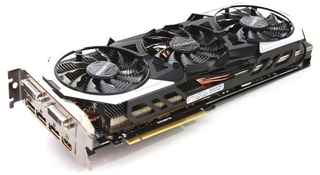 It seems like the ideal card for me would be a GTX 980 or 980 Ti. I’ve seen a few 980s on Craigslist for right around my budget, but I’m wondering if I should hold out a little longer until the Ti version hits my price point. The performance improvement seems to be noticeable from the benchmarks I’ve seen, but I’m wondering if I will always have some lingering doubt about the missing performance if I don’t wait and get the regular 980. Also, are there any other places I should be looking for an older video card other than eBay and CL? Anybody know anyone that has recently upgraded and have an old card sitting around?